Knit and Natter: If you are a keen knitter and enjoy having a chat with friends while making your next garment or toy, why not go along to the Hardware Shop this afternoon, Thursday, at 2.30 pm to join the Knit & Natter group that meets there on the second Thursday of the month. The meeting is held on the ground floor of Dudley House, with the entrance via the shop; a suggestion donation of £1.50 covers the costs of refreshments that are provided. From what I’ve heard, this is a very social group and you don’t necessarily have to be a knitter to join, you could go along for the ‘natter’ alone! The Refuse Freighter: will be in the parish on Saturday. It will be in the car park in front of St Mary’s in Slaugham between 10 and 11 am before moving on to the Seaforth Hall in Warninglid where it will be between 11.10 am and 12 noon. Please remember, if the freighter isn’t there, do not leave your rubbish for the operatives to deal with! Also, no computer or electrical items can be disposed of in this way and only a small amount of garden waste is allowed to be taken as this kind of waste should not go into landfill. I’m sure if you are unsure as to exactly what you can leave, the operatives will be able to help. The Royal Oak: is hosting a Charity Night on Saturday in aid of the Danny Gallivan Trust, a small military charity to help veterans from all conflicts to get back on their feet if they have fallen on hard times. If you would like more information about the Trust, their website is www.dgtrust.org.uk. The doors open at 6 pm, there will be live music from Hollow Vibe and as always at such events, a raffle. If you would like more information about the night as a whole, call 401406. If you are joining the Outing Club: for their trip to the London Eye and Cable Car over the Thames on Sunday, the pick-up times are as follows: Haywards Heath 1 pm; Cuckfield 1.10 pm; Staplefield 1.15 pm; Truggers 1.20 pm; Windmill Platt 1.25 pm and finally, 1.30 pm. Please try to be on time at your pick-up spot in order to avoid any knock on delays further down the line. 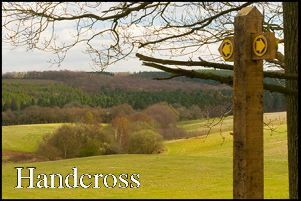 Handcross Ladies Association: meets in the Parish Hall on Tuesday, 17 October from 7.30 pm. As always, non-members are welcome to join them and this month’s speaker is an auctioneer, who I’m sure will be very interesting and amusing. There is a small fee payable to cover the meeting’s costs as well as the home made cakes that are always a popular feature at such meetings! The Rosemary Club: are going on an outing this month next Wednesday, 18 October rather than their normal meeting. They are off to the English Martyr’s Church in Goring on Sea to see the frescos and murals which resemble those of the Sistine Chapel in Rome. The pick-up times are as follows: 10.30 am at the bus stop in Pease Pottage; the Hardware Shop at 10.45 am, Truggers at 10.55 am and then Covert Mead at 11.05 am with the last pick-up at 11.15 am at Tanners Mead in Staplefield. Members will be treated to a free lunch at the Sussex Yeoman. The Community Bus: has three trips planned to aid you in your search for this year’s Christmas presents; yes, it is getting to that time of year again! The first trip is on Tuesday, 28 November to Polhill Garden Centre, one of the largest garden centres in the county with 2 cafes and a wide range of gifts etc to choose from. The second is to Canterbury on Tuesday, 5 December which was a very popular trip last year and the final one on Saturday, 9 December to Winchester for their Christmas Market, another popular trip. If you would like to put your name down for any of these trips – and seats are allocated on a first come, first served basis – get in touch with Christina in the Hardware Shop or call her on 400212.